It’s been a while, Measure and Stir. Is anyone still reading this feed? I can’t promise I’m going to post with any regularity but I’ve been away for a while and lately I’ve been feeling the itch. I haven’t been posting, but I have been learning. I have been spending a lot of time developing my technique. In the past, I confess there were times that I sacrificed the quality for novelty in pursuit of new and unusual drink recipes. I am humbler now, and I will try to push my limits to bring you new drinks that are more subtle, more balanced, and more refined. Tonight I found myself craving a small digestif. I keep a backup for my backup bottle of fernet, and I knew I wanted a no-nonsense kind of a drink. I started with the idea of an old fashioned fernet cocktail, but I was out of simple syrup. Shameful. Instead, I reached for elderflower as the sweetener, because I have seen St. Germaine mixed with Fernet before, and I found it to be a pleasing combination. Fernet is already bitter enough, so instead of bitters, I wanted to add a base spirit as the smallest component. I like elderflower and mezcal, so I felt like it was a natural choice. 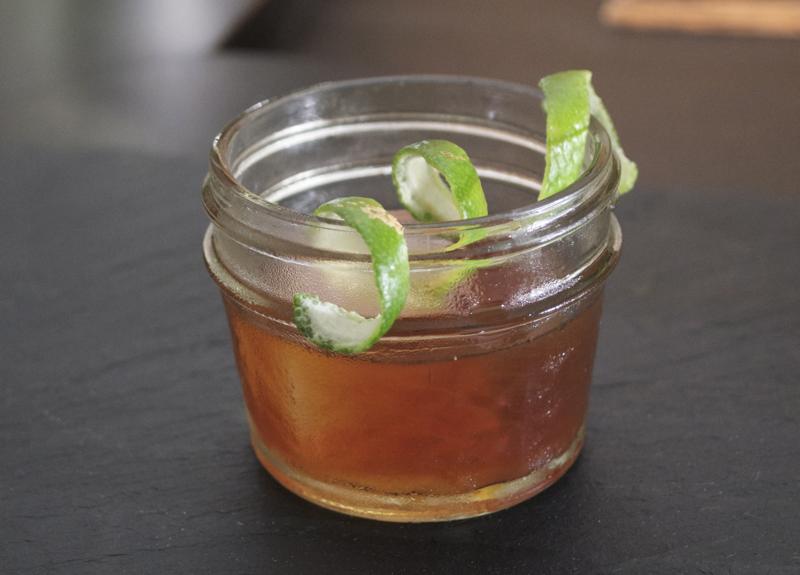 Stir and strain into a chilled mason jar with a large ice cube. Garnish with a lime twist. A savory quality emerged in this drink. The pür elderflower is not quite as sweet as St. Germain. If you are using St. Germain, you should probably use .5 oz, but if you are using pür like I did, you might consider .75. The elderflower in this ratio cut the bitterness, but it did not contribute as much to the end flavor as I would have liked. Even so, the intersection of these three ingredients had a savory, almost bacony quality, It started with Fernet’s bitterness on the sip, gave way to elderflower and agave, and concluded with smoke and menthol. Categories: modern drinks, original creations | Tags: alcohol, bartending, cocktail, cocktails, craft cocktails, drinking, drinks, elderflower, fernet, fernet branca, liquer, liquor, mezcal, spirits, st. germain | Permalink. So we were brainstorming what to do with various teas, and we wanted to try every way we could think of to get tea into a drink. We tried infusing the tea in spirits, and in vinegar, and in syrups; we tried brewing the tea and reducing it, we tried matcha, we tried adding boiling tea to hot toddies and chilled tea to iced-tea style drinks. We had one drink that failed three times. Sometimes you just have to make peace with your failures… Cardamom and earl grey are just too similar to make a nice drink together. But this is not a post about failure! 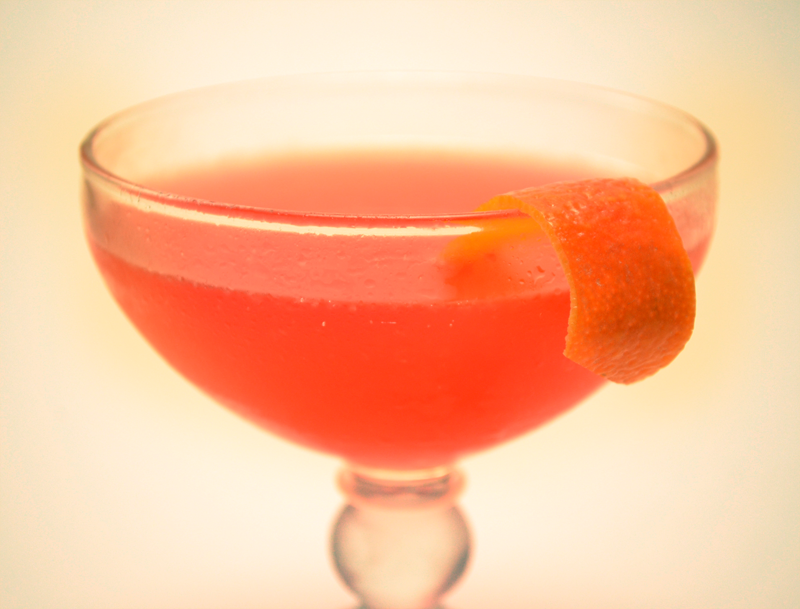 This is a riff on a drink we made last summer, the Blood and Oak. I wish I could say it was for Mixology Monday, but it isn’t. I inverted the um, uh, the– I inverted the infusion! Normally you would infuse the base spirit, but for this one I infused the liqueur. I’m so edgy. Shake over ice and double strain into a coup. Garnish with a blood orange peel. This was a little too sweet. I wanted that lapsang souchong in the drink, but the syrup just added unnecessary sugar. You can see I followed the same formula that you would for a Blood and Sand. I infused the campari with a dried ancho chile, seeds removed, for about two hours. You have to watch a chili pepper infusion very carefully — overdo it and it turns into mace. I think if I had to do it again, I would put the lapsang in with the ancho, and just infuse it all into the campari. Bump up the proportion to .5, and I think you would have a much more respectable drink. And adjust the proportions to your taste. You need to select an amount of orange juice that mediates, but does not nullify, the capsaicin burn from the chili, and it might be that .75 oz works better. That depends on the strength of your infusion and your own good taste. Sorry I missed you, MxMo, and Cheers. Categories: original creations | Tags: alcohol, ancho, ancho chili, bartending, blood orange, booze, campari, cocktail, cocktails, craft cockails, del maguey, drinking, drinks, infusion, lapsang souchong, liqueur, liquor, mezcal, mezcal de vida, mixed drinks, mixology, spirits, tea | Permalink.